Patagonia® Denim: ‘business as usual’ has never been their style. In terms of durability, we all know a pair of jeans is about the longest lasting thing in our wardrobes. A favourite pair fits well and gets better with age and there are very few articles of clothing that have such a timeless appeal. What’s so special about Patagonia® Denim? If you’ve read our FAQ ‘Why Organic Cotton?’ you will already know that conventional cotton manufacture (and in particular cotton manufacture for the denim fabric market) is one of the most harmful pollutants on the planet. That is why since back in the 1990’s Patagonia® has insisted on making the move to using 100% organic cotton in all their cotton garments. This season’s new Denim range from Patagonia® has been a long time coming as they wanted to get it right. Patagonia® Denim uses only 100% organic cotton and, significantly, a low-impact dyeing process that uses 84% less water than before, 49% less energy than before, less fabric waste and produces 25% less CO2. Not only that, Patagonia® uses Fair Trade™ Certified for sewing and they don’t use harsh chemicals to ‘distress’ the fabric, so you will be pleased to learn that as you would expect, Patagonia® Denim is built for gettin’ dirty but its manufacture is as clean as it gets. 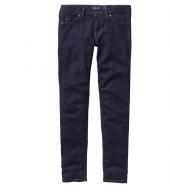 Regular Fit Jeans: these are a rugged, regular fit, non-stretch 5 pocket style with a straight leg and zip fly. ‘Regular Fit’ means they sit on the waist and have a full seat with a more relaxed thigh and are cut straight down to the ankle. Great for all body types and the larger or more athletic build. It is the attention to detail that matters and the pocket edges are bound for a more durable finish and all the rivets are antique-nickel ‘pitons’. The lower part of the rear pockets are also reinforced for additional durability – ideal for a lifetime of stuffing your wallet into them (and sitting on it) or a tool. We stock them in both regular (32inch) and long (34 inch) leg lengths. Straight Fit Jeans: The fit on these is awesome. Rugged, non-stretch and a proper, modern slim fit that’s neither too skinny nor too loose so perfect for a lean to medium build. A classic 5 pocket design as you would expect with all the same detailing as the Regular style and we stock them in both regular (32 inch) and long (34 inch) leg lengths. Performance Straight Fit Jeans: Not just any jean, this is a Patagonia® heritage piece in the making. These have the same great fit as the Straight Fit (perfect for a lean to medium build) but are in a mid-weight (9.7oz as opposed to 12.5oz) Organic Cotton with mechanical stretch, blended with COOLMAX® T400 polyester fibre for moisture management. They also have a weather resistant DWR (durable water repellent) finish. Great for an active lifestyle or simply mucking about with the family outdoors. We think you’ll love them and as they’re pretty exclusive you’d better get your pair soon as we don’t think they’ll be on our shelves for long!